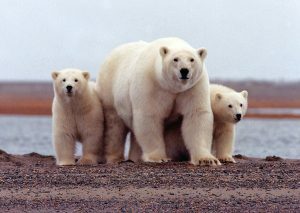 ANCHORAGE, Alaska — President Donald Trump’s plan to help balance the federal budget features a new attempt to open the coastal plain of Alaska’s Arctic National Wildlife Refuge to petroleum drilling. The refuge covers 2,300 square miles (5,957 square kilometers), an area the size of West Virginia and Connecticut combined in Alaska’s northeast corner. WHAT’S THE HISTORY OF THE REFUGE? Alaska Natives have used it as subsistence hunting grounds for thousands of years. President Dwight Eisenhower in 1960 signed legislation creating the refuge. Congress in 1980 expanded it and declared much of it wilderness, but threw in a wild card: Recognizing the oil production potential, Congress declared that the coastal plain, tundra stretching from the Beaufort Sea to the foothills of the Brooks Range, should be studied. Another act of Congress and presidential approval can open it to drilling. READ NEXT: Can Arctic ecosystems survive without river icings? The U.S. Geological Survey estimates the coastal plain holds 10.4 billion barrels of oil — compared with 25 billion at the older Prudhoe Bay oil field to the west. Republican U.S. Sen. Lisa Murkowski of Alaska calls the refuge’s coast plain North America’s greatest prospect for conventional oil production. The plain is 60 miles (97 kilometers) east of the trans-Alaska pipeline, which operates at one-quarter capacity as North Slope oil fields such as Prudhoe Bay have declined. Alaska is draining billion-dollar savings accounts to pay for schools and roads and is anxious to find more revenue. Gov. Bill Walker says it’s frustrating to be denied access to billions of barrels of oil in an area specifically set aside to be evaluated for resource development within miles of a pipeline that’s three-quarters empty. North Slope crude was selling for nearly $54 a barrel Tuesday. Alaska could benefit from jobs, additional taxes and federal revenue sharing if the refuge opens. WHAT STANDS IN THE WAY OF DRILLING? The refuge is about as wild a place as there is. There are no roads, no campgrounds, not even established trails. And the environmental community and some Alaska Native groups want to keep it that way. Besides polar bears, the coastal plain is home to muskoxen, the nests of 200 species of migratory birds, and for part of the year, the vast Porcupine Caribou Herd — 197,000 animals that roam between the refuge and Canada’s Yukon and Northwest Territories. Environmentalists say America should pivot toward renewable energy, not add to climate warming by burning oil extracted from wilderness and generating greenhouse gases. “The fact it’s happening to what’s supposed to be a refuge for wildlife only adds insult to injury,” said Kristen Monsell, an attorney for the Center for Biological Diversity. HAS CONGRESS VOTED ON OPENING THE REFUGE BEFORE? Between the House and Senate, Congress has voted 49 times on the Arctic National Wildlife Refuge, according to the Alaska Wilderness League. Both chambers approved a bill to open the refuge in 1995, but President Bill Clinton vetoed it. Murkowski is optimistic that a Trump administration and a Republican-controlled Senate and House present a new opportunity to open the area for development. WHAT WOULD OPENING THE REFUGE DO FOR THE FEDERAL BUDGET? Interior Secretary Ryan Zinke acknowledged Tuesday that the ANWR item in the president’s proposed budget is a placeholder. Lease sales are not likely before 2022, Zinke said, and winning bids could generate $3.5 billion over 10 years. If companies find oil, production would generate royalty payments and federal and state taxes. Zinke said America needs refuge oil in the trans-Alaska pipeline to reach Trump’s goal of “energy dominance” and to help balance the federal budget. Murkowski has legislation pending that would open the refuge but limit oil company infrastructure, such as drilling pads and roads, to 3 square miles (8 square kilometers). Environmentalists say that figure is misleading, because oil operations would require multiple drilling pads connected by roads and pipelines. They say Murkowski’s bill would create a spider web of industrial blight across the plain, and if it passes, they would sue to block it.